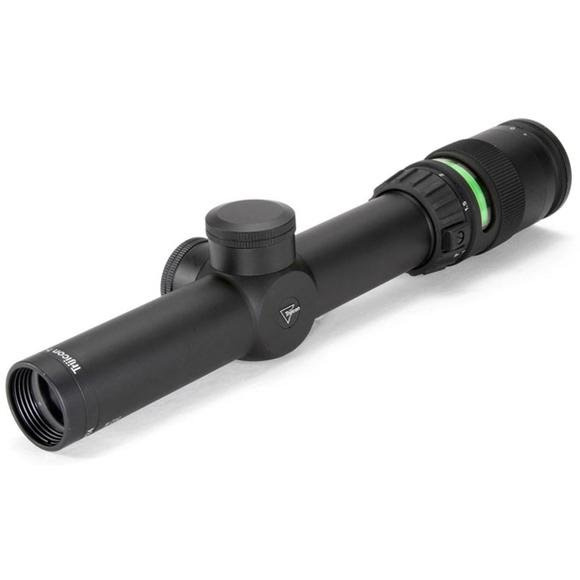 Mating a BAC crosshair reticle with a fiber optic and tritium illuminated with center dot, Trijicon's AccuPoint TR24 rifle scope represents the newest innovation in rifle scope design and maufacture. Mating a BAC crosshair reticle with a fiber optic and tritium illuminated with center dot, Trijicon &apos;s AccuPoint TR24 rifle scope represents the newest innovation in rifle scope design and maufacture. Fully mulit-coated high end glass, a quick focus eyepiece with long eye relief and construction that shirks off the effects of the harshest conditions found on earth complete this target acquiring technical masterpiece. BAC with Fiber Optic and Tritium Illuminated Triangle: Non-batter powered. Tough Exterior: Scope body is crafted from aircraft-quality, hard-andodized aluminum. All-weather regged construtction protects against the toughest the elements can dish out. Manual Brightness Overrride: Easily adjust the Trijicon Aiming Point brightness to your personal preference. Longer Eye Relief: Provides unparalleled eye relief and protects against the high-impact recoil from larger caliber rifles. Easy Focus Eyepiece: Ensures unsurpassed edge-to-edge optical clarity. Tritium-Phosphor Lamp: Aiming reticle glows in low light conditions for quick target acquisition. Solid Black-Matte Finish: Elimiates glare and light reflection. Multi-Layer Coated Lens: Superior clarity and light gathering capabilities with zero distortion. 6061-T6 aluminum, hard coat anodized per MIL-A-8625, Type III, Class 2 dull & non reflective. Reticle BAC with Fiber Optic and Tritium Illuminated Triangle: Non-batter powered.